State Rep. Jay Barnes, left, was chairman of a committee that looked into former Gov. Eric Greitens' conduct. 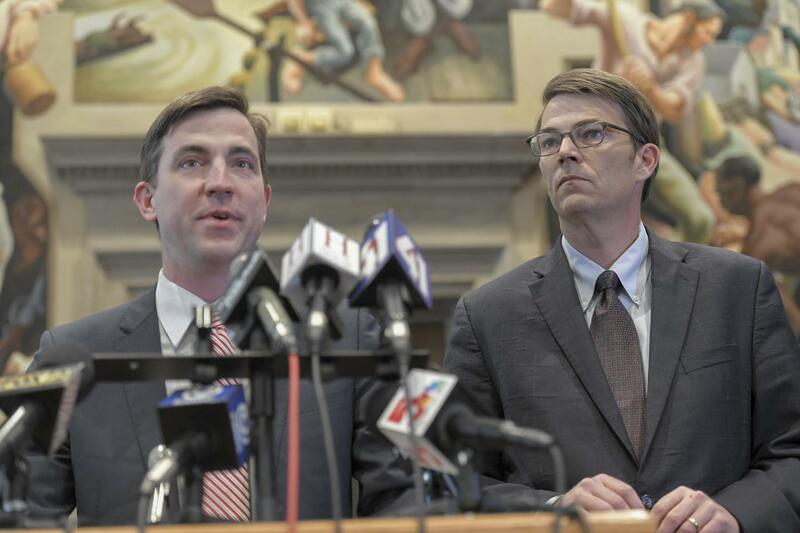 The Missouri House committee tasked with investigating former Gov. Eric Greitens’ conduct released its final report on Monday — and a renewed a call for action by the state ethics commission. The ethics commission does not comment on whether any investigation is pending. “I think the allegations he makes with respect to campaign finance law simply misapply the law to the facts,” Hanaway said. The committee was established this year after news of Greitens’ marital infidelity became public. He was accused of a multitude of offenses, including invasion of privacy and using his former charity’s fundraising list for political purposes. Both of those criminal cases were dismissed. Greitens was facing near certain impeachment in the Missouri House when he stepped down in early June. Lt. Gov. Mike Parson then assumed the governorship. One new piece of information concerns the potential release of documents that the committee obtained. Later in the report, there’s correspondence from Barnes to a number of attorneys representing various people involved in the Greitens scandal. He told them that the committee had received a number of open records requests related to the investigation. A representative from St. Louis Circuit Attorney Kim Gardner’s office and Hanaway wrote back, asking Barnes not to release certain documents. In a letter to Barnes, special assistant circuit attorney Rachel Smith said government records related to Greitens’ criminal case were not subject to open records laws. Gardner spokeswoman Susan Ryan said that "it appears the House honored our agreement." Legislative emails became open records once an amendment, known as Clean Missouri, went into effect. St. Louis Public Radio placed open records requests to both Barnes and another committee member, state Rep. Gina Mitten. Mitten, D-Richmond Heights, produced emails and documents responsive to the request on the same day. Included in the emails that Mitten sent to St. Louis Public Radio were correspondence from Hanaway and Greitens' attorney Ed Dowd to committee members. Dowd was requesting specific people testify before the committee, while Hanaway was summarizing how she felt her clients cooperated during the investigation. Missouri Gov. Eric Greitens allegedly directed a staffer to obtain a donor list from the veterans charity he founded and lied about it to the state ethics commission, according to a special House committee report released Wednesday. Immediately, Democrats and some Republicans again called for Greitens, who faces two felony charges, to step down. Greitens' camp dug in with legal counsel Catherine Hanaway's statement that said the report "does a tremendous disservice to the U.S. and Missouri Constitutions."